I'm not sure if Bonnie Hearn Hill is going to be able to stop by on her blog tour this time around. But book two of the Star Crossed series is out! 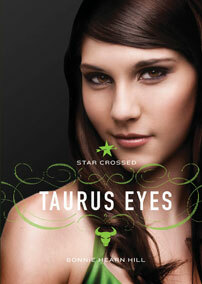 Taurus Eyes is now available for purchase. Below are a couple of her earlier stops this month and a synopsis of the new book below. Logan McRae is spending her summer at the camp of her dreams, thanks to her discovery of that amazing book, Fearless Astrology. Away from home and her friends, she now finds herself faced with a new set of challenges, a new enemy, and maybe even a new guy. From the moment Jeremy Novack grabs her hand on the ghost-tour bus, Logan feels an immediate connection. She's sure Jeremy feels it too. But in order to secure a coveted writing spot in a national teen anthology, Logan must impress her instructor Henry Jaffa, the renowned journalist who is editing the book. She feels confident that she will shine with her brilliant astrological piece about Sun signs, but then Jaffa switches everyone's topics! Now Logan has to compete with Jeremy, who seems obsessed by their shared topic about the ghost of an obscure dead singer. Logan has only the stars to guide her as she tries to win the respect of her idol, write a stellar essay, and capture the heart of her newfound crush.